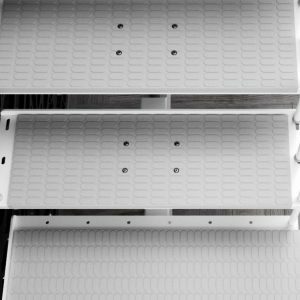 The kit staircases are delivered direct to your door and the timescales are usually within 10-15 working days unless stated otherwise. The staircases, which are shipped from the Italian manufacturers, are sent to a central depot in the UK. The delivery on to your address will be handled by a haulier local to you. This is all part of the built-in delivery service and you need to do nothing! Your contact phone number/s are passed to the courier for them to contact you beforehand and they should ring you to give you next day notice for the delivery. The delivery service is organised from Italy and the final delivery vehicle is usually an 18 tonne lorry with a tail-lift facility. The staircase arrives securely packed in a palletised crate with any additional cartons for riserbars, balustrading etc. The delivery is kerbside only and the carrier will offload the consignment as close to your property as access will allow. The driver is not insured to carry any goods into your home. The staircases typically weigh over 150 kgs and customers often find it easiest to lift the lid of the crate and carefully carry some of the components into the property to lighten the weight of the crate for easier maneuvering. From our customers’ experience, we can say that this is not a difficult process and usually takes less than 15 minutes. If there are any access problems at your property, please let us know when you place the order and we will liaise with you to organise the best delivery arrangements. It is important to organise this at the time of ordering as the carrier will make a charge to us (which will be passed on to you) for any changes of address once the order has been placed. A charge will also be raised and passed on to you, if the driver cannot deliver the goods because there is no-one at the the delivery address to accept the consignment. Some of our staircase kits are delivered direct to you from the UK warehouse, generally with a much quicker delivery time. The delivery will be handled by a haulier arranged by the manufacturer and they will be provided with your contact details. The delivery, again, is to kerbside only. Can you be contacted during the day on the phone number/s you have provided? Will someone be available to receive the consignment at the expected dates? Do you have any access or delivery problems? If so, please let us know in advance. Will there be an able person on site ready for the delivery on the agreed day? Do you have storage space ready for the staircase crate? 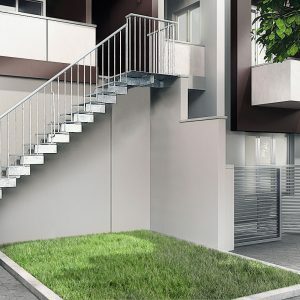 If you live above the ground floor, do you have means to carry the staircase to your home e.g. a lift? It is sometimes possible for us to arrange a special delivery e.g. for a specific date and time, or weekend delivery, at an extra cost. Moving such large items as staircase crates is a relatively expensive process and we will obtain a quotation for you for any requirements beyond the standard service. We have experience in shipping our products around the world, from USA to Hong Kong, and we can arrange for delivery to almost anywhere in the globe. Please let us know if you need an International Delivery and we will obtain a quotation for you which will also have to include maritime insurance. Deliveries to Northern Ireland will incur an additional delivery charge of £25.00. Click here for the link to the delivery charge and simply add it to your basket when you order your staircase. Deliveries to the Republic of Ireland, Isle of Man, Isle of Wight and the Channel Islands may incur an additional delivery charge. Please contact us on 01380 723533 for a quotation and to arrange delivery. IF ACCESSORIES ARE ORDERED SEPARATELY FROM THE STAIRCASE AND NEED TO BE SHIPPED FROM ITALY, THERE WILL BE AN ADDITIONAL DELIVERY CHARGE OF £65.00 INC VAT. Please note that the Italian manufacturers close during August and this will affect the delivery schedule at that time of year.